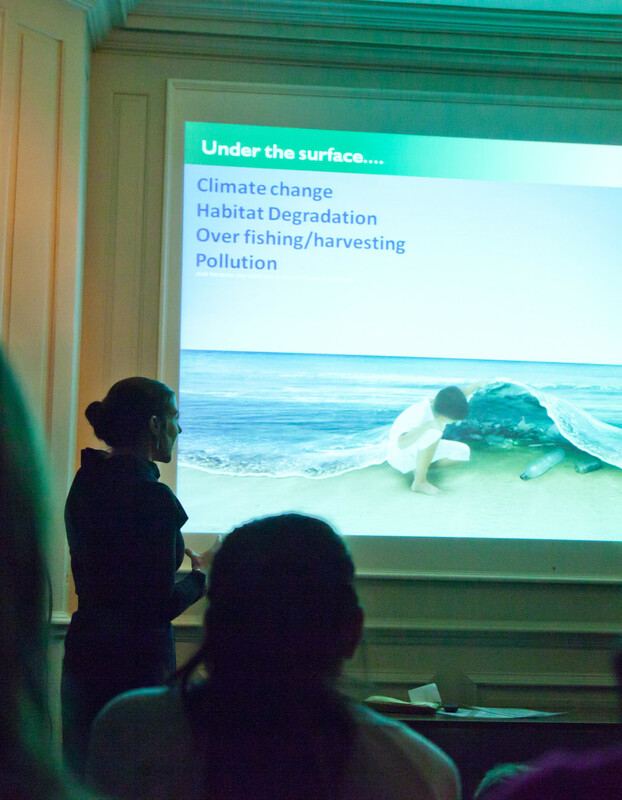 Not to be daunted by one of the largest environmental challenges that the human race is currently facing, for our second event, ONCS took on marine conservation as the topic of discussion. 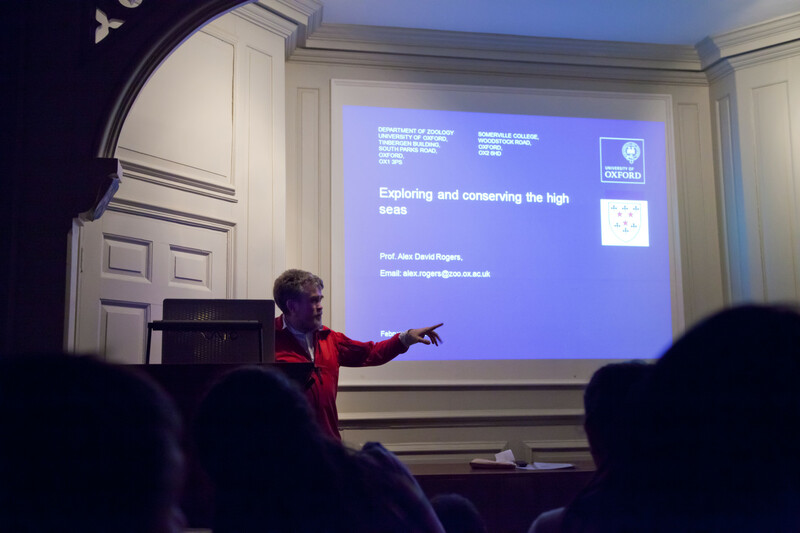 We were a little more daunted by the large audience that turned up for the event – but happily everyone was content to cram themselves into the room in Pembroke College, or even hang out in the hallway outside in order to listen to the speakers. Thanks to everyone who tolerated the resulting humid conditions! Dr. Martin Speight gave us an upbeat and entertaining introduction to the somewhat depressing issues surrounding coral reef conservation. As many members of the audience were, we are sure, aware, the forces of climate change, ocean acidification, pollution and physical damage are working synergistically to try and deprive us of coral reefs by the end of the century. However, there are still sources of hope; conservation schemes that recognise the ecological connections between mangroves, seagrass beds and coral reefs can successfully enhance recruitment of species that require all three habitats at different points in their life-cycles. We were also informed that we can all make an important contribution to reef building processes by ensuring that we visit coral reefs and throw empty bottles into the ocean. Whether the contents of the bottle should have been alcoholic or not remains to be properly researched. 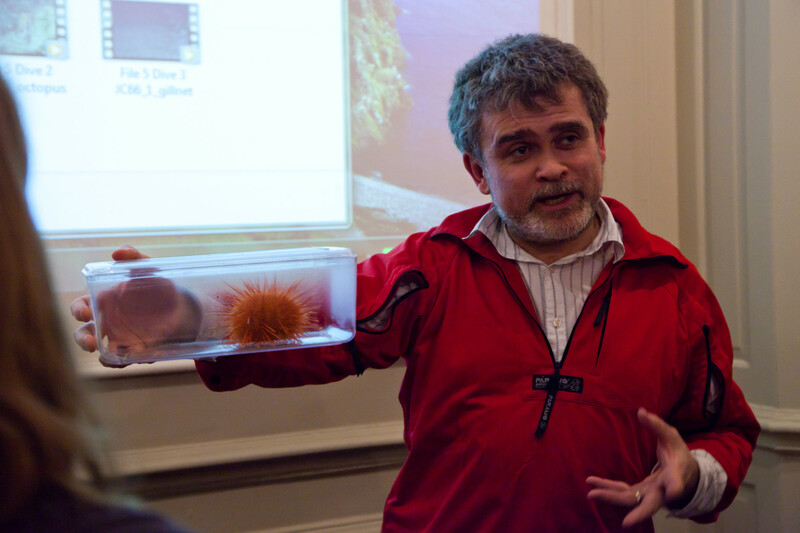 Prof. Alex Rogers then gave us a fascinating insight into his work on the little known world of sea-mounts – underwater mountain ranges that are hotspots for marine species. It is thought that upwellings of nutrients at the sea-mounts result in the high levels of diversity, and each sea-mount can have its own distinctive assemblage of species. We are only beginning to characterise the sea mount communities, especially the particularly impressive cryptic species. It is an area of research that deals with figures up in the thousands, in terms of the depths at which the work is done, the age of the organisms on the seamounts, and the cost of the equipment required! However, even at such great depths, this important habitat has not escaped human influence. The work carried out by Alex and his research group, mapping and surveying the sea-mounts, reveals that deep water trawling is already damaging these seascapes and lobster pots are also being set thousands of miles offshore. Targetted fish species like the orange roughy have also drastically declined in numbers. And much of the fishing activity is not legal or intentional. Boats registered for fishing only in shallower waters have been spotted on the sea-mounts. Nets that have been lost from vessels elsewhere also continue to ghost fish on the sea-mounts, further depleting the unique assemblages there. Even so, many sea-mounts remain predominantly undisturbed, and if their importance and uniqueness can be highlighted and more widely recognised, we will still be able to protect these habitats. Alex and his team are working towards this goal, trying to improve regional fisheries management so that vulnerable areas are avoided. They have already achieved some notable successes; within the last few years resolutions have been passed at the UN general assembly to help ensure that the impacts of fishing on sea mounts are assessed and fishing can be better controlled in these areas. There is hope but there is still a lot of work to be done. Our final speaker was Dr. Samantha Burgess, from the Oxford-based organisation Earthwatch, who told us about the marine conservation projects they run. Earthwatch helps survey marine protected area surveys in Belize, monitors leatherback turtles in Costa Rica, and studies the interactions between mangroves and reefs in the Bahamas. Full-time members of staff help run the projects, and teams of volunteers are sent out throughout the year to assist with the work. The volunteers come from a wide variety of backgrounds; anyone can choose to take part on a project, but Earthwatch also has long term links with large corporations such as HSBC, who send their employees out to contribute to conservation work. The Earthwatch projects help ensure that native species get the best chance to survive the challenges facing all marine ecosystems in the C21st, and also provide the volunteers taking part with a valuable insight into current environmental issues. Many Earthwatch volunteers have returned home and made changes in their own lives with a positive environmental impact. Our marine event finished with a look at some of the specimens that Alex and his team have brought up from the depths of the seamounts – including inky black angler fish, corals and sponges. It was pretty special to see creatures from thousands of meters under the sea in an Oxford college thats about as far from the ocean as you can get in England! We’d like to thank all the speakers for sharing their knowledge of marine life and the threats facing our ocean, but also particularly for highlighting the rays of hope that remain for conservation efforts in and on the seas. 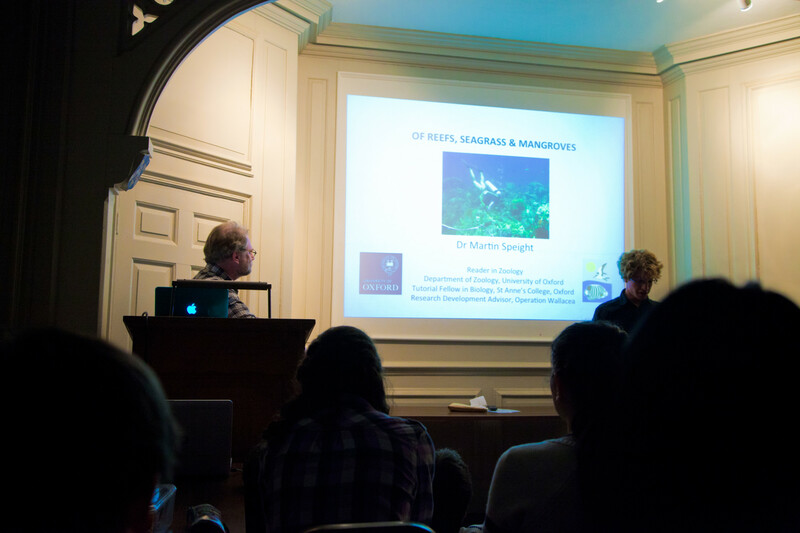 For a theme which could have easily provided some very disheartening talks, our evening delving into marine conservation issues was both entertaining and uplifting.